During his senior year of high school, Jake Hannah of Canton, North Carolina, knew he wanted to pursue a degree in marketing at ETSU. Now, with graduation just a few months away, he is looking ahead to his next journey. What led you to ETSU? I come from a town in Western North Carolina that is just minutes from the Blue Ridge Parkway. I love the climate there and being able to go hiking anytime, and I knew that attending ETSU would keep me close to the mountains. I love anything that involves being outdoors! You love the outdoors and competitive sports, right? Definitely! My favorite sport is softball. I have been very involved in intramurals here at ETSU, not only playing intramurals but also organizing intramural teams. Sometimes I recruited my friends, but other times I have approached people randomly at the CPA and asked if they wanted to be part of my team. 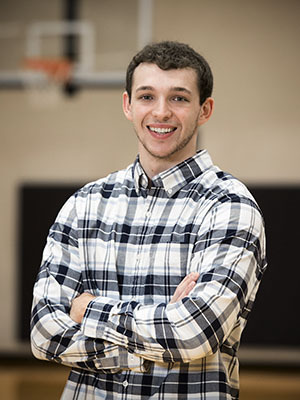 I love playing sports and working out at the CPA, and it has been a great way to make friends and connect with people. In fact, that is how I have made some of my best friends. Graduation is less than three months away. What’s next? I am very interested in pursuing an M.B.A. here at ETSU. I chose advertising as a minor, and I am very interested in a career that involves marketing, advertising and integrated communications. In my courses, I have enjoyed working with the new Adobe solutions and also being part of group projects where we develop strategies, so a dream job would be to work in an advertising firm. How have you spent your summers while at ETSU? Usually I went back home. I had a part-time job at Burke’s Outlet and I was also involved with my church. We would take a youth trip to Fort Caswell on the east coast every summer for a youth retreat. I started going a few years ago and now I enjoy being a role model to the other youth. Definitely get involved. During my first semester at ETSU I stayed in my dorm room a lot and that was not fun, but when I started participating with intramurals and attending The Well, I made some wonderful friends.